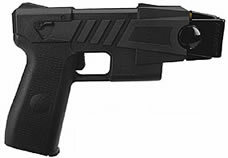 The new Advanced Taser M-18 series has almost 100% effectiveness rating. It combines the injury reducing benefits of traditional stun technology with a quantum leap in stopping power via new Electro-Muscular Disruption (EMD) technology. In police studies, the new Advanced Taser has a higher instant incapacitation rate than a 9mm hand gun. 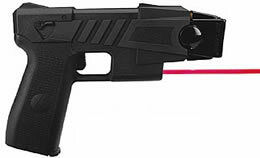 The Advanced Taser shoots out 2 darts attached to 15 feet of wire. 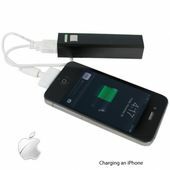 50,000 volts travel over the wires and over-rides the central nervous system providing incredible takedown power. There are two categories of energy weapons: Stun weapons and EMD weapons. 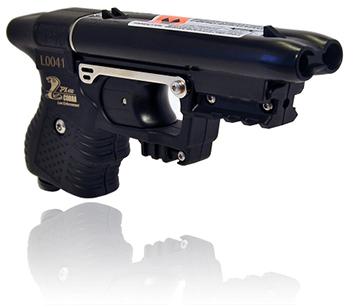 EMD WEAPONS: EMD weapons use a more powerful 18 to 26 Watt electrical signal to completely override the central nervous system and directly control the skeletal muscles. This EMD effect causes an uncontrollable contraction of the muscle tissue, allowing the M-Series to physically debilitate a target regardless of pain tolerance or mental focus. The ADVANCED TASER M-Series are EMD weapons -- specifically designed to stop even the most elite, aggressive, focused combatants. Rather than simply interfering with communication between the brain and muscles, the ADVANCED TASER EMD systems directly tell the muscles what to do: contract until the target is in the fetal position on the ground. MODEL #34220: 2 pack of Air Cartridges. 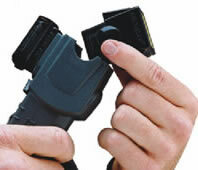 Reload your ADVANCED TASER in less then a second with replacement Air Cartridges. Price shown is for two cartridges. 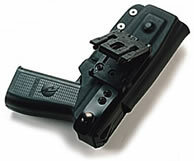 MODEL #44860: NEW cartridge holster for Advanced Taser. 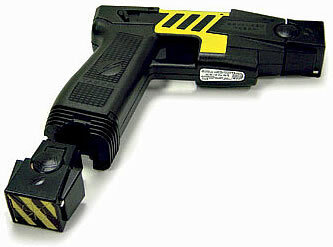 Attaches to the bottom of Advanced Taser and stores one extra cartridge. Feel safe knowing that one extra cartridge is less than a second away.